In the first two posts of this series, Wrapping Artwork for Shipping Part 1: Works Framed with Glass and Wrapping Artwork for Shipping Part 2: Paintings on Canvas and Panel, I emphasized the need to properly prepare artwork for shipping and discussed issues specific to wrapping these types of artworks. In this post, I will offer options and suggestions for wrapping unframed works on paper. Following this, my final post on this topic will cover notes on shipping and shipping options. These posts are written with a “do-it-yourself” agenda, endeavoring to offer tips for those who would prefer to do it themselves rather than hire professionals. However, remember: when in doubt, call a professional! (A few professional art wrappers listed at the end of this post). If possible, the best way to ship (or store) an unframed work on paper is to have the work matted between an archival mat-board backing and mat-board window. This way, the work is safe from shifting, as works are hinged to the mat window with archival tape or tissue. For more information on what makes a mat-board archival, read this. For more information on the anatomy of matting and what it looks like, read this. If you are unable to mat the work you are shipping, you should wrap the work in glassine. To do this, cut a piece of glassine slightly more than twice the size of the work in each direction. Place the work face down in the center of the glassine. 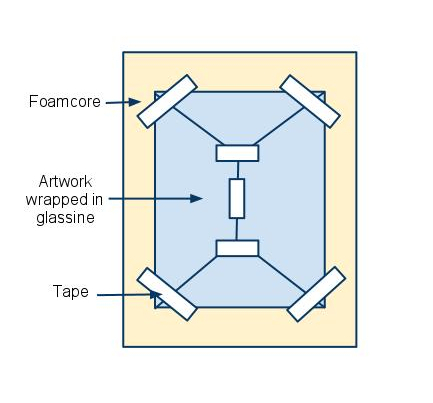 Fold the excess glassine over the work as if you were wrapping a gift, and tape in place. If you are using a mat-board and mat-backing, also wrap it in glassine using this technique. Cut two pieces of foamcore larger than your glassine-wrapped work (2″-3″ extra on each edge). Lay one piece of foamcore down, then center your work on it. Use painters tape (or any other removable tape) to tape the four corners of your artwork to the foamcore. Lay the other piece of foamcore over top, sandwiching your work evenly between the boards. Tape in place. Wrap the bundle in bubble wrap or clear poly plastic, sealing the seams with packing tape. Sandwich your package between two pieces of doorskin or other solid, rigid material cut to the same size as your bundle. This is to protect the artwork from puncturing. Tape together with packing tape. Insert your artwork into a cardboard box that fits the bundle snugly. If the box is too big, cushion the work with foam or bubble wrap to avoid any movement of the work within the box. Any other shipping specifications you think will protect your work, such as: “fragile”, “glass”, “do not stack”, “this way up”, etc. Although I don’t think it’s ideal, many people roll unframed artworks into tubes to ship. I wouldn’t recommend this as it can be difficult to flatten the paper later. Also, with watercolour (or any other delicate paper), rolling can crack the sizing within the paper. If you must ship this way, put a sheet of glassine on the face of the work before rolling. I hope that these three posts have been helpful in offering advice for wrapping artwork for shipping. My final post in this series will discuss options and considerations for shipping itself. Thanks for sharing your blog to all of us! Thank you for all the great info. Very very helpful! Would you recommend glassine wrapping for unframed watercolors and chalk paintings? Hi admin, do you monetize your thepracticalartworld.com ?